The class C receptor family includes neuronal metabotropic receptors for amino acid transmitters (glutamate, gamma-aminobutyric acid (GAB A)), as well as members which can sense small molecules such as calcium ions or sugars. Despite their compact ligands, these receptors are distinguished by a very large N- t erminus that forms the exclusive orthosteric binding domain (Fig. 2.4a) . Part of the N-terminus forms a two-lobed structure related in evolution to bacterial periplasmic binding proteins, involved in the transport of similar small molecules. Ligands such as glutamate are recognized by hydro-philic interaction with amino acid residues in both lobes. Their binding leads to the closure of the lobes around the agonist molecule at the interface, commonly referred to as the Venus flytrap (VFT) mechanism. This process, and the converse prevention of VFT domain closure by orthosteric antagonists, has been extensively studied by crystallography of the isolated N- t erminal ectodomain (e.g., mGluR1; [52, 53]). With the exception of GABAb receptors, the VFT domain is followed by a second structured N-terminal region, called the cysteine-rich domain. 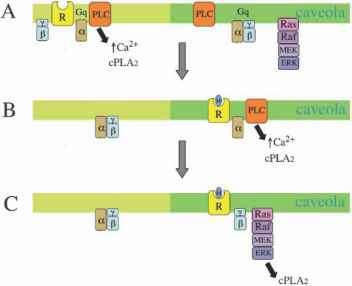 This participates in the transmission of the agonist-induced conformational changes in the N-terminus (VFT closure) to the 7TM domains responsible for G protein coupling  . The ability of class C VFT domains to form constitutive dimers is also an essential structural element in the activation process, as discussed below (2.5.1).